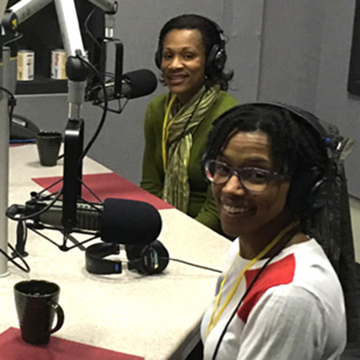 In our inaugural Breakthroughs podcast, Feinberg scientists Mercedes Carnethon, PhD, and Kiarri Kershaw, PhD, MPH, discuss their striking discoveries in the area of health disparities. "High blood pressure tends to develop at a younger age in African-Americans in comparison with whites and tends to be more severe and is less controlled, which poor control ultimately can lead to downstage complications such as high rates of stroke and chronic kidney disease." Over the past 50 years, medicine has made significant progress in preventing, treating and curing disease. And yet, this progress has not been seen equally across all groups. Scientists Mercedes Carnethon, PhD, vice chair of Preventive Medicine, and Kiarri Kershaw, PhD, MPH, assistant professor of Preventive Medicine, are deeply invested in identifying health disparities — those differences in health outcomes between populations, such as racial, ethnic, geographic, socioeconomic, gender and other groups. Kershaw was the lead author of a new study, published in JAMA Internal Medicine, that found the systolic blood pressure readings of African-Americans dropped between one to five points over 25 years when they moved to less-segregated areas. The publications are representative of Kershaw’s research expansion from epidemiological findings to also exploring potential solutions. Kiarri Kershaw: "We were able to look at changes within the same individual when they move from a segregated area to a less segregated area to see what happened with their blood pressure during that same period of time. We were able to show that people who move to less segregated areas experience at least a millimeter mercury reduction in their systolic blood pressure." Mercedes Carnethon: "High blood pressure tends to develop at a younger age in African-Americans in comparison with whites and tends to be more severe and is less controlled, which poor control ultimately can lead to downstage complications such as high rates of stroke and chronic kidney disease." Carnethon was the senior author of a study published in JAMA that revealed black and white people have the same risk of developing diabetes when all biological risk factors, such as obesity, are considered over time. The study upended long-held beliefs that there is an unexplained or genetic reason black adults have double the rate of diabetes compared with white adults. Mercedes Carnethon: "The reasons for disparities in diabetes are fairly straightforward. They tended to be attributable directly to differences in obesity. The solutions to that are very complex, a number of factors at the individual level, health behaviors at the neighborhood level and at the macro structural level contribute to the behaviors that influence obesity risk and much of the research that Dr. Kershaw was doing in our neighborhoods can actually serve to describe these neighborhood factors and how they influence individual behaviors." Many intervention projects are also underway, including diabetes prevention in Hispanic communities and exploring mindfulness interventions for depressed women in disadvantaged populations. Read more about Kiarri Kershaw's study, which was published in JAMA. Read more about Mercedes Carnethon's study, which was published in JAMA. Mercedes Carnethon, PhD, & Kiarri Kershaw, PhD, MPH, have nothing to disclose. Erin Spain: Welcome to Breakthroughs, a podcast from Northwestern University Feinberg School of Medicine, I’m Erin Spain, editor of the Breakthroughs newsletter, which features top Feinberg scientists who are investigating fascinating questions about human health. On today's inaugural episode, we're expanding on the February cover story of the newsletter by welcoming two of our scientists who have made some striking discoveries in the area of health disparities, Mercedes Carnethon, vice chair, preventive medicine, and Kiarri Kershaw, assistant professor of preventive medicine. Thank you both for being here. Mercedes Carnethon, PhD: Thank you for inviting us. Erin Spain: Can you both tell me in your own words, health disparities? What does that mean? Mercedes Carnethon, PhD: When I have the opportunity to speak with communities about health disparities, I often like to open up with the question which is how many of you know somebody who has had a heart attack or who has diabetes or high blood pressure? And inevitably, particularly if I'm speaking with a community of black or Latino or lower socio-economic status, almost everybody raises their (hand in the ) room to one of those three questions and then it lends itself to a discussion where I ask, “why do you think you know so many people with this?” And people know the reasons why, you know, they know that they don't have the money to be able to afford a certain foods. They know that they don't have the money to be able to join an exercise facility or the time or the time, you know, they're juggling multiple jobs, they're juggling low paying, high stress jobs, children and the challenges of raising children in this environment these days. And they are prioritizing their health even less. Kiarri Kershaw, PhD, MPH: The part that I try and impart on people is that it's the inequality of it or the inequity, which is not technically necessarily disparities, but I think that's what we are talking about. We're not just talking about a different... dome people have a higher level of obesity than others. It's part of, part of it is the “why?” and that is that it seems to be an equal or not what you would expect due to chance or due to genes alone, so I think when I talk about it, I talk about it like that and have people think about, you know, imagine if you lived in a place with act limited access to this or where you had to worry about making it home safely. I mean how important what you eat, but you know, or like, or how important eating survived servings of fruits and vegetables or whatever it be to you. So, trying to get people to think or be into other people's shoes. But I think the inequity part of it is what I try and to get to sink into other people. And when you talk to about it. Erin Spain: I want to start with you. Dr. Carnethon, you've several papers in recent years with some headline making findings about cardiovascular disease and diabetes and African Americans. How did you get into this field of studying health disparities? Mercedes Carnethon, PhD: So, I started my training in the area of epidemiology, which is the study of disease in the population and risk factors in the population. I chose to study cardiovascular disease because it is the leading cause of death. And what I noticed upfront where there were marked disparities in who experienced cardiovascular disease, the age at which they had cardiovascular disease and their outcomes. And I was very fortunate to always work on studies that included a diverse sample of participants. And so, I was always able to infuse my research with some degree of study of disparities in the population. I came here immediately following a post-doctoral fellowship at Stanford University and the medical school there. And I saw the opportunity here at northwestern to work with a, at that time, relatively small team of successful scientists who had a long history of doing heart disease research in the population. I had really outstanding mentorship by the then department chair Dr. Philip Greenland, and by Dr. King Lou, who really supported my research interests and connected me with people in cardiology who are able to provide me with patient populations so that I could address some mechanistic questions. Uh, and so really it, it, it has remained an outstanding place for me to do my research. And as my research program has broadened to incorporate more elements of community engagement, recruiting from populations and communities, the city of Chicago has been an outstanding research lab for me to be able to look at these many disparities. Erin Spain: And now, I mean, you've recently been published in some major journals, Jama, you've made some headlines in the New York Times and one of your frequent collaborators is sitting next to you here, Dr. Kershaw. And I want to know, how you two met. You're working together a lot. Just give me a little background on how you've sort of come together as a team of scientists. Kiarri Kershaw, PhD, MPH: Yes. I'm. Well doctor Carnethon and I started working together on one of my dissertation papers back in 2008 I believe., I didn't know her by face at that time because we were working on one of these large multi-site cohort studies. And so she was working at northwestern, which is one of the field centers for the multi-ethnic study of atherosclerosis. And my advisor had recommended that I add her and then I got to meet Dr. Carnahan person at the American heart association scientific sessions. And she told me about the POSTDOC program. the teeth are two postdoctoral fellowship program here at northwestern and I ended up coming and so she was my mentor at the postdoc program and then she's my faculty mentor and we've been collaborating ever since. Erin Spain: You got her here? Mercedes Carnethon, PhD: Yeah. And you know, I have to say the addition of Dr. Kershaw to our first postdoctoral program and our faculty has been a real success because it's expanded my research focus. Dr. Kershaw’s has expertise, has always been on neighborhood influences on health, which is an area that I've acknowledged is very important to, heart disease disparities but not something that I had the training to do. And Dr. Kershaw has had very excellent training in that area and has been able to infuse all of our research within the department and within the institution of the awareness and recognition of the importance of neighborhood and place on health. Kiarri Kershaw, PhD, MPH: We were talking before about how Chicago is a great microcosm for the kind of inequalities that are pervasive throughout the country. Chicago is one of the most diverse areas in the country, but it's also one of the most segregated areas. and you see with the high rates of crime that we've been seeing and , the talk about food deserts and different opportunities in life expectancies and chances across neighborhoods within the city. And a lot of those have effects on health. Well, yeah, I mean you've just recently published a couple papers that have to do with health and it shows that African Americans where they live may an impact things like their blood pressure or risk for cardiovascular disease. Told me a little bit about those particular studies. I've been very fortunate to be able to work with these large multi-site cohort studies, cardiac in particular, which one of the most recent studies where we looked at a segregation and blood pressure, the participants in the cardio steady, we're 18 to 30 years old when they started the study back in the 1980s and you can imagine all the things that you did when you're 18 to 30 men, you're moving out of your parent's home for the first time moving to college for the first time. So it's a perfect study to look at where people move and how these decisions can relate to their health. So, a lot of the African American study participants started off in highly segregated neighborhoods. But over the first 10 years of the study, they moved to less segregated neighborhoods. A lot of them. So we were able to look at changes within the same individual when they move from a segregated neighborhood to a less segregated area to see what happened with their blood pressure that same period of time. So, it's a pretty powerful study to design that we were able to do using this a long extended follow-up in the cardio study and we were able to show that people who move to those less segregated areas experience at least a millimeter mercury reduction in their systolic blood pressure. And when we looked at the people who stayed, they experienced three to five-millimeter mercury reductions in their systolic blood pressure. Erin Spain: And what does that mean? How does that impact health? Kiarri Kershaw, PhD, MPH: Yeah, so I mean at a population level and because we have to think about also that these are healthy individuals. They're not necessarily sick individuals, some of them are, but it means better control management of your blood pressure. If you have high blood pressure, it means keeping your blood pressure low, which all of which results in a reduction in your risk of having heart attacks or strokes and since African Americans in particular at much higher risk of dying or having a heart attack or dying of a heart attack or stroke, it's really important to have even these small different reductions in your blood pressure, better management of that disease. Mercedes Carnethon, PhD: And if I can follow up about the blood pressure issue. I recently was fortunate to lead a scientific statement on behalf of the American Heart Association where we described the cardiovascular health of African Americans and I think what really stood out in that statement are the marked disparities in hypertension or high blood pressure as a significant driver of differences in rates of stroke and congestive heart failure and chronic kidney disease. And so Kiarri’s findings are particularly important because they highlight one of the sources of these disparities that we see in high blood pressure rates. And, and where it becomes particularly important is that high blood pressure tends to develop at a younger age in African Americans as compared with whites and tends to be more severe and is less well controlled, which poor control then ultimately can lead to these downstage complications such as high rates of stroke and chronic kidney disease. Erin Spain: You've recently published about diabetes and African Americans. Tell me a little bit about some of those findings and your recent JAMA article. Mercedes Carnethon, PhD: Diabetes is the seventh leading cause of death in the United States. However, most people with diabetes do die from cardiovascular diseases. And back in 2000 when I was just finishing my doctorate, there was a very important paper that came out from a cohort of middle aged adults that attempted to measure the contribution of modifiable risk factors to disparities in diabetes and middle age and older adults. And the results of that paper showed that while the modifiable risk factors explained about half of the disparities, particularly among women, they didn't explain them all. And so I spent 15 years of my career thinking I would love to be able to repeat this study and identify what comprises that other 50 percent. And so we had a recent opportunity - we work with a great team of post-doctoral fellows - and now one of those fellows, Dr. Michael Banks was able to take this on because he had the skill set methodologically to be able to model these complex associations. And so, Dr. Kershaw was able to contribute her expertise in neighborhood environments so we can include in this model of lifestyle factors, things such as a neighborhood levels of poverty, which influence one's ability to eat healthy foods, to be able to be physically active and also influence stress levels, each of which have been associated with diabetes onset. And so, we created this mathematical model that attempted to pull together all of these classes of risk factors, biological risk factors, predominantly driven by rates of obesity, neighborhood level risk factors, as I mentioned on Dr. Kershaw's research and neighborhood poverty and segregation, behavioral risk factors, dietary intake and physical activity and psychological risk factors. So depressive symptoms and when we included all of those factors in the model and accounted for, how they changed over time, what appeared to be a three times higher rate of diabetes and black women as compared with white women was completely eliminated. And what we found and what was most compelling is that this was largely driven by changes in body mass index over time. So the prior report had only accounted for body mass index, which is a marker of obesity at a single point in time at baseline. As you can imagine, back when the coronary artery risk development in young adult studies started in 1985 and 1986, we weren't faced by the obesity epidemic that we face right now. So that cohort was formed prior to the start of the obesity epidemic. Had we just taken into account those baseline risk factors, we wouldn't have seen those stark differences in rates of obesity between black and white women in particular. What we were able to do with the updated risk factors over time is a account for how these patterns of weight change influenced diabetes risk over time leading to higher rates of diabetes in black women as compared with white women. And so I think our final statement on that really is that the reasons for disparities in diabetes are fairly straightforward. They tended to be attributable directly to differences in obesity. The solutions to that are very complex, a number of factors at the individual level, health behaviors at the neighborhood level and at the macro structural level contribute to the behaviors that influence obesity risk and much of the research that Dr. Kershaw is doing in our neighborhoods can actually serve to describe these neighborhood factors and how they influence individual behaviors. Erin Spain: Why is it important that people understand what health disparities are and how they're impacting people in our community? Kiarri Kershaw, PhD, MPH: In order to change these health disparities, we need to build better health promoting policies, and I think we need people to back these policies and to understand that this is not an individual making bad decisions in isolation. Without that understanding, without that kind of backing and pressure to build these healthier policies, then people are going to continue to be left behind and these disparities will grow as technology and technological advances improve. Gaps are getting bigger, incoming quality gaps, but also these health gaps are getting bigger as well. Mercedes Carnethon, PhD: I think when we talk about strategies to eliminate disparities is generating good data that describes these disparities. We've been fortunate that for some time the major health promoting agencies in the country have collected data in multiple race and ethnic groups. However, in recent years, the minority populations that have seen the largest growth, the Hispanic, Latino community and the Asian community have been less well represented in our population based cohort studies. Some time ago, the Hispanic community health study launched and includes 16,000 Hispanic Latino adults from across the country. I've been involved with that group leading studies on obesity and metabolic risk factors in Hispanic and Latino youth. We need similar longitudinal or long term follow-up studies in these populations. Hispanic Latinos have among the highest rates of diabetes in the country and Asian Americans have surprisingly high rates of diabetes, even at a lower body mass index. And these populations, as they immigrate to the United States, have very unique social situations, cultural situations. And we're finding out that as they acculturate to the US population and health behaviors, sometimes their indices of health go down and we need further research in all of these race and ethnic groups. If we're really going to make strides in eliminating disparities. Erin Spain: And there's some roadblocks there, how do you get these people to want to take part in research? Mercedes Carnethon, PhD: Absolutely, we have been doing, at our institution, we have a number of collaborators who engage in a style of research called community engaged research where they reach out, identify stakeholders within certain race and ethnic groups that they're trying to target, let them know about the research and even let them contribute to the research process and the questions that are being asked. That's the groundwork and the ground level effort that needs to happen to get people excited about research. And then also when, so the type of research that the cardio study and some of the population based cohort studies that Dr. Kershaw and I have been involved in, we do population based sampling. So when we call it would be great if people could take their time to join our study. We were able to form a cohort of 600 adults so that we could study race and ethnic differences and sleep. Because we know that sleep behaviors are important for long-term cardiovascular disease risk and we were able to get a large number of Asian, Hispanic, Latino, black and white participants. And so we've had great success with this in Chicago because we have so many wonderful community members who are enthusiastic about contributing to the research process. Erin Spain: You're literally calling. Mercedes Carnethon, PhD: We're calling, we're knocking on doors. The Hispanic community health study completed its recruitment by randomly identifying addresses in certain communities and sending teams of people out door to door to knock on doors. And Dr. Kershaw has had great experience recruiting where she's used different strategies that are equally effective. Erin Spain: Tell me about those. Kiarri Kershaw, PhD, MPH: Yeah, I mean, I think the biggest thing that was successful for us is identifying a community partner, community liaison who knew the area and new people that we could meet with. So, for example, we went, I had one community coordinator who she had a lot of relationships with the schools in Humboldt Park in Logan Square because she used to be part of this parent networks. So they have a parent mentoring network. And so, she met with her context there and we did a lot of our interviews in the school. There were a lot of women who only spoke Spanish that we really wouldn't have identified or recruited otherwise with our traditional kind of mailing, protocols or calling people because people don't always feel comfortable or trusting of researchers who want to come in, get people to participate. But having Daisy, our community liaison come and vouch for us, they were much more willing to participate. And now we're working on our dissemination materials, which I also think is important, you know, letting people know what you found because I think one of the things people don't like is if you go in, you get what you need and then you don't ever come back. So, we're working on those materials now to go back and share with them and see what they think and, and to start thinking about, OK, how do we do something about this? We see this problem here, what are some strategies for intervening? Erin Spain: What does this particular study that you did in the Humboldt Park? Logan Square neighborhood? Kiarri Kershaw, PhD, MPH: We called it the Chicago Healthy Eating Environments and Resources study, so as part of my career development award to go out and collect data in four neighborhoods in Chicago, so Humboldt Park in Logan Square where two of them, but we also went to Beverly and Uptown, and so we identified a community partner in each of those neighborhoods and we've recruited participants in, interviewed them onsite at the different places in the community or at the local libraries. Just make it easier for people to participate. And so, we interviewed 25 women in person and then 275 online and we're working on compiling the findings now and kind of sharing them so that we can start thinking about next steps. And, and part of it is to do more of a deeper dive into what parts of the neighborhood or how people use their neighborhoods or you know, where do they shop? Where are they physically active, things like that. But also, if we know this is a problem or you know, people aren't eating well, you know, how can we start trying to like, intervene and think about, you know, how can we make it easier for people to make healthy decisions? Erin Spain: I was going to ask you to, you know, what a typical day is like, but boy, it sounds like you could be in a neighborhood in Chicago talking with one of your liaisons and groups of the community members or you can be, with one of your big associations like the American Heart Association writing an important scientific statement. Mercedes, maybe just tell me a little bit about the variety of work that you do here at Feinberg. Mercedes Carnethon, PhD: So, while it Feinberg, I do a variety of work, as you point out, some proportion of my work is a carrying out research studies using large cohort populations that we've already collected. I have the pleasure of directing a post-doctoral training program where we have very enthusiastic a young well-trained physicians and PhD trained scientists who asks innovative questions that we hadn't initially conceived of when these cohort studies reformed, and so I spend a large part of my time helping people think about new approaches to answer questions by carrying out these research studies. Some other part of my time is spent as well brainstorming on ways in which we can turn our observational study findings into practical interventions or approaches to try to improve health. Know One of those that I'm working in close collaboration with a faculty member in Psychiatry and behavioral sciences is the ability of coming up with ways for people to better cope with the stress in their lives. And this is particularly relevant to the research that we're doing and disparities. Dr. Anger Burnett Ziegler has developed interventions to help promote mindfulness, which is a great strategy for managing depression, chronic stress and anxiety. And we're looking at how those types of interventions can help in adults with and without existing chronic diseases to better manage their lives, make better choices, and improve their health outcomes, and I also am enthusiastic about the opportunities that I get to speak with people who are at the forefront of making policy. What Dr. Kershaw pointed out is that oftentimes the blame, if you'll say, is placed on the individual, you know, why is this person obese? Can they change their behavior while they can't change their behavior? When the environment itself is what we call obesogenic, with fast food available, lack of safe spaces for exercise and policy makers can actually have a large influence on these by trying out strategies to create health promoting environments. And so I look forward to continued opportunities to translate and disseminate our research findings to the people, the movers and shakers who can actually make a difference on a large scale. Erin Spain: Thank you, Dr. Kershaw and Dr. Carnethon for being the first guests of the Breakthroughs podcast. You can read the full article and learn more about their research online by visiting Feinberg.northwestern.edu/breakthroughs. I'm Erin Spain, editor of the Breakthroughs newsletter. Thanks for listening.